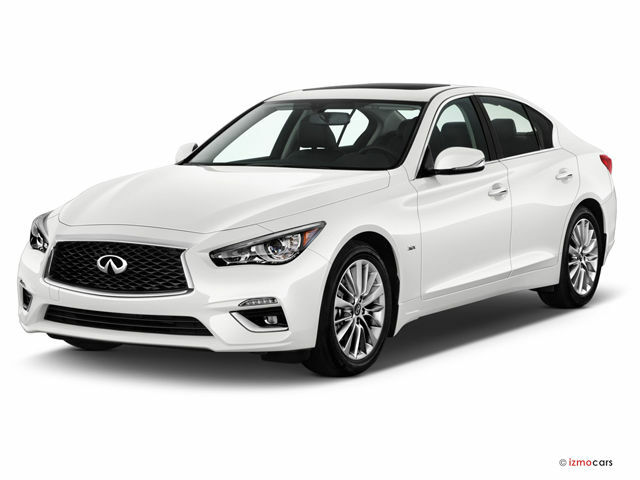 The 2018 Infiniti Q50 is the automaker’s most popular vehicle and returns this year after a modest restyling and reshuffling of its trim levels. The major changes include new front and rear bumpers, some light, stylish interior refinements, and a reshuffled trim lineup. These changes are enough to score a 7.0 out of 10 on our overall scale. 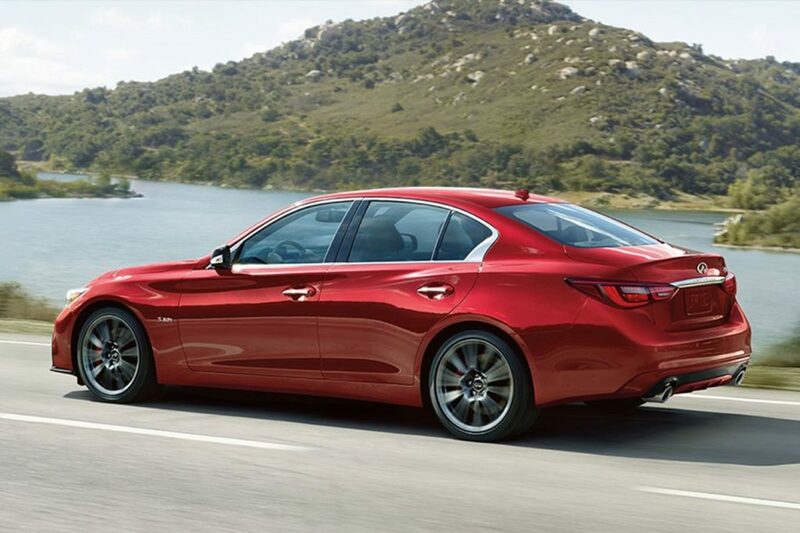 The Q50 Pure replaces the base model, which is only available with the 2.0-liter, turbocharged inline-4. The Luxe replaces the Premium and will likely be the best-selling trim for the Q50. It’s available with either the 2.0-liter turbo-4, a 300-horsepower version of Infiniti’s 3.0-liter, twin-turbocharged V-6, or with a V-6-powered hybrid system. The Sport brings some stylish trimmings and a standard V-6, while the Red Sport 400 carries on with a 400-horsepower V-6. Those engines are largely unchanged. The 2.0-liter, turbo-4 pumps out 208 horsepower and 258 pound-feet of torque while returning 23 mpg city, 30 highway, 25 combined with its standard rear-wheel-drive arrangement. The optional all-wheel-drive model drops those figures to 22/28/24 mpg. The 3.0-liter, twin-turbocharged V-6 offers 300 hp and 295 lb-ft of torque in 3.0t guise or 400 hp and 350 lb-ft in Red Sport 400 tune. 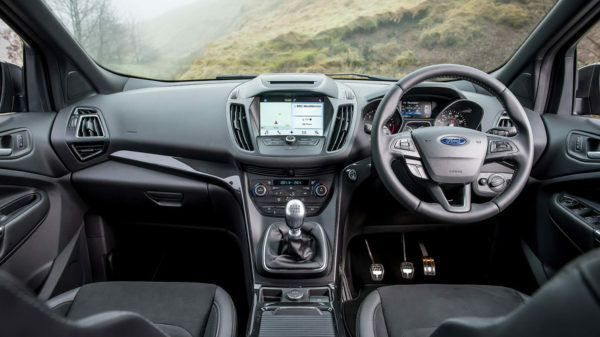 Both engines come standard with rear-wheel drive, while all-wheel drive is an option. Look for 20/29/23 mpg for the 3.0t—regardless of Luxe or Sport trim—with rear-wheel drive and 19/27/22 mpg with all-wheel drive. The more powerful Red Sport 400 sacrifices more fuel, returning 20/26/22 mpg for rear-drive examples. Going for all-wheel drive and 400 hp only costs one mpg in the city. All engines are mated to a 7-speed automatic—no manual to be found. Finally, the Q50 Hybrid returns 27/32/29 mpg in rear-drive trim or 26/30/28 mpg with all-wheel drive. The combination of a 3.5-liter V-6 and a 67-hp electric motor results in a total system output of 360 hp.